Our lovely young patient had lifelong problems breathing freely through her nose. 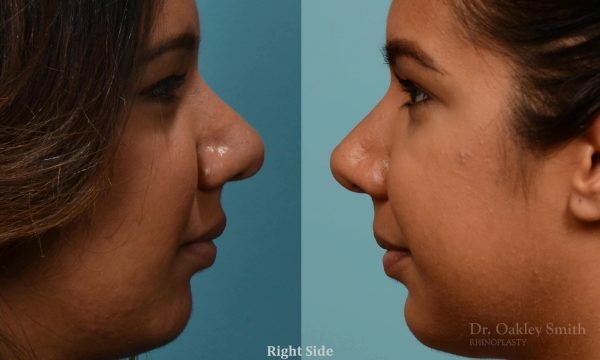 She also wished for a generally smaller and narrower nose. 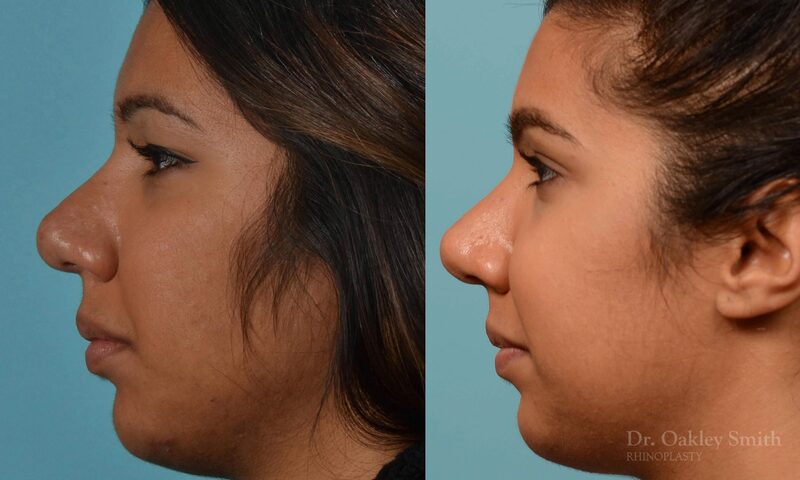 She disliked the slight bulge to her right which made her nose look bent. 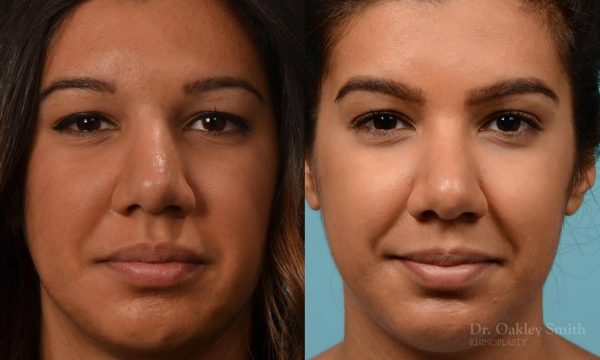 Having researched rhinoplasty surgeons online, she had become educated enough to realize her thick skin was going to be an issue. The open approach was chosen so the soft tissues below her skin could be excised. About two millimeters of fat and fibers were cut out thereby, making the skin/soft tissue envelope half as thin. This surgical technique must be performed very carefully as poor technique and/or over aggressiveness can compromise the blood supply to the overlying skin. Should this happen, the skin will turn black and die, eventually resulting in visible scarring for life. Dr Oakley Smith has been approached by two patients operated elsewhere with this complication hoping for a cure. Unfortunately once scarring has occurred, although it may be improved, it can never be returned to normal. This is another sad reminder how very important it is to chose your rhinoplasty surgeon wisely. The postoperative results show improvement. Her breathing was restored to normal and her nose is smaller and narrower. Did she wish she could have had smaller and narrower? Of course, as anyone would. However pushing the envelope increases the risks of several additional complications of which Michael Jackson is the poster boy. Persian noses are particularly at risk as surgeon may become overly aggressive in order to make greater degrees of improvement. 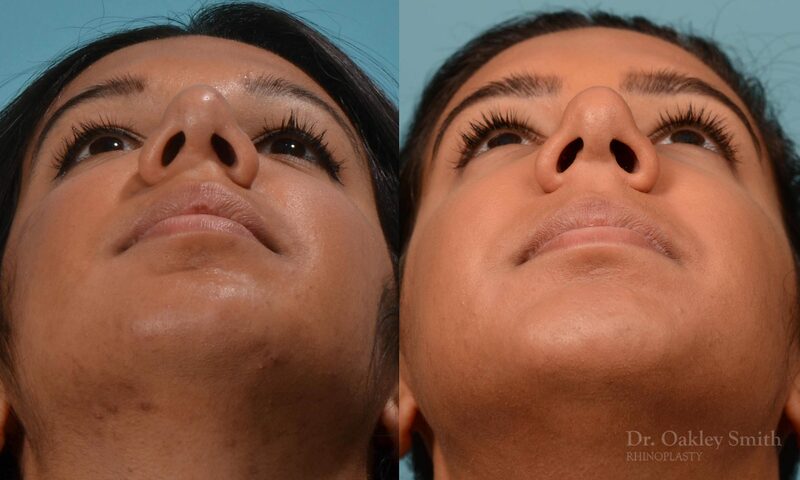 Often the initial results are very good and both the patient and surgeon are happy. 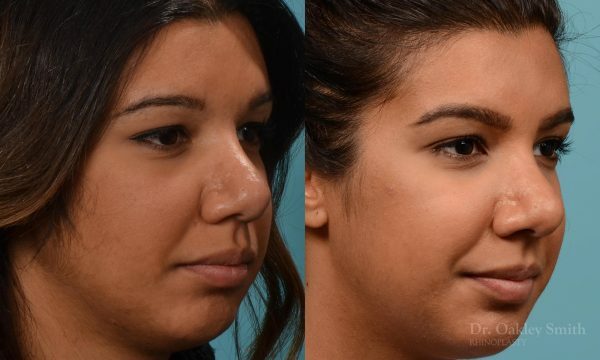 However, over weakening the nasal framework doesn’t cause issues to arise immediately and the twisting, collapsing, and impaired nasal breathing usually start to show up many months to many years later. 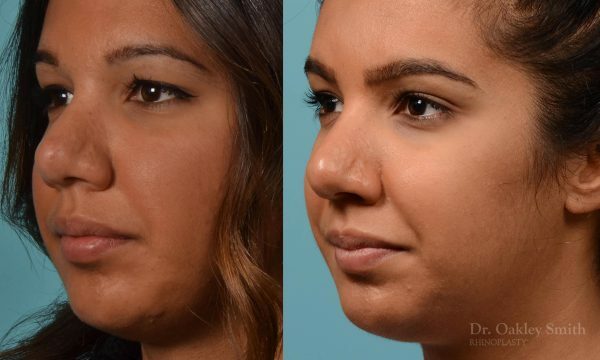 Before and after rhinoplasty photos of a thick skinned patient of Dr Oakley Smith, a recognized rhinoplasty expert based in Toronto.